Sennheiser PXC 550 - my new favourite headphones | fischirocks! A few days ago I had a surprise package in my mail – I got my Sennheiser PXC 550 as a present from my amazon wish list. Okay, I was not really surprised, because I knew that I would get them. After all I put them on my wish list. With the price of them being currently at €339 on amazon, they were a little too expensive for me. Sennheiser suggests selling them for €400 – that’s definitely a hefty price for some headphones that I want to use for leisure activity. For playing music live I still use my SHURE SE846. They are great in-ears, but for everyday use I wanted to have overears. This was the first thing that made me really happy. They sound really good. Really really good. I used quite a lot of headphones over the year, and this wireless set is up there with the best. Nice basses that do not mud the sound combined with clear heights, and a good punch to the music. It almost sounds like a high quality HiFi-set. I also let my girlfriend try them. To be fair, she normally listens to music on an original BOSE bluetooth box from Thailand. But even with the standards set quite low, it was amazing to see her eyes light up when she suddenly heard all the details from the music. The noise suppression also helps the sound a lot – lowering the background noise enables you to listen at a low volume, without missing out on anything. I also watched a football match with the headphones on, and I got a little annoyed with the low sound quality of the co-host on DAZN. It almost sounded like he was talking through a phaser. But this dos not fall back on my review of the Sennheiser PXC 550. Actually it does the opposite, as I was able to hear the flaws in their audio. The second thing that is a huge plus for me is the comfortable fit. I barely take them off anymore. Some people wrote about them being too tight, but they fit my ears perfectly. Even when listening to audiobooks for five hours straight, I had no intention of ever putting them off. No pressure, no strange sounds, and really comfortable even at the top of my head. Nailed it for me. One of my favourite features is the noise suppression. While it does not switch everything from the outside off, it really reduces the volume of your surroundings. That is a great plus in the office as well as at home, or even while listening to some sleep music and drifting away on the couch. I really do not want to take them off. And I don’t have to – I just take my phone calls with them. The sound quality of the phone calls is really nice. Hands free, accepting a call by simply tapping the side of the headphones. The one thing I did not really master now is the handling of the talkthrough mode. By double-tapping the headphones you can switch off the noise suppression. But I do not really have the right touch right now to make this work. I am wearing them at this very moment. Actually, all the time. They have some decent looking exteriors, like a leather handle, and really nice features along with that. You can see the pictures – they look great. And I think my ears won’t be visible too much for the forseeable future. The Sennheiser PXC 550 looks really smooth. Not in an pushy way. They are slick and nice. Exactly what you want in a business look with a knack for music and technology. I am so happy with these headphones. 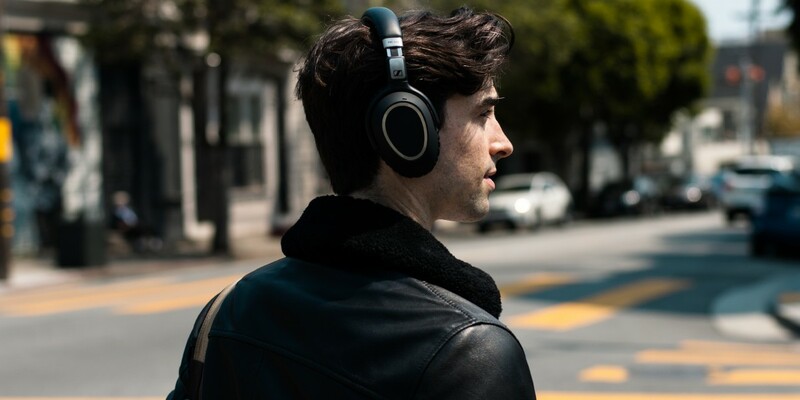 Exactly what I expected – great sound with a nice wearing experience. I would not use them on stage as an in ear monitoring. But for listening to music while working, and for enjoying great sound in your free time, they are the real deal. You can get them at Amazon right now.